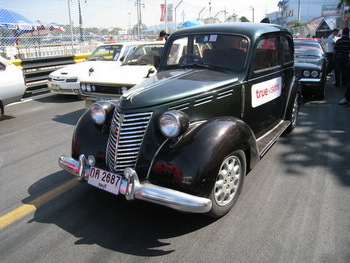 Italian classic cars from Alfa Romeo, Fiat and Ferrari took centre stage as more than a hundred historic machines paraded around the temporary sea side race track as Thailand's annual street racing extravaganza kicked off in Bangsaen. After three days of acclimatisation, practice and qualifying the Bangasaen Thailand Speed Festival 2009 cranked up a gear as the first round of the weekend's races took place across the many categories. The organisers did a superb job to line up a vast array of classic cars, and so many significant ones, with the majority being European. There was well over a hundred cars, all in superb condition and interesting. They lined up in a huge column outside the circuit ready to parade themselves, their immaculate, shiny coats glistering in the relentless morning sunshine, adding more welcome diversity to this extravagant event. From Italy there were a whole swathe of historical gems drawn from the Alfa Romeo, Fiat and Ferrari stables that stood out, from a very early Fiat, probably the oldest car on show in Bangsaen on Saturday, to a highly unusual Polski-Fiat. 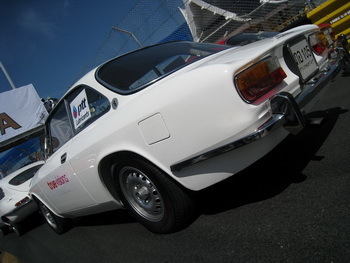 Alfa Romeo was represented by four cars on the grid, a stunning boat tail Spider 2000 gleaming in the sunshine with its roof down and two Bertone-designed Giulia Coupés one a lustrous-white 2000 with its distinctive heart slats and quad-headlights, the other an Alfa Red GT Junior. This fabulous trio from the Milanese marque were complemented by a Giulia Super 1300 TI, fitted with a more-modern-era TwinSpark engine, which had been taking part in the Euro Classic race category in the event. 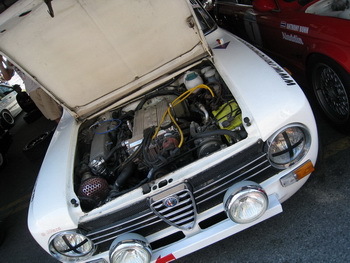 This nimble, stylish runner stood out from the BMW 3-series hordes in the class on track and was complete with roll-cage, taped-up headlights, an elegant ever-so-thin wood steering wheel bearing the Nardi Milano logo on the horn push, as well as a period Martini Racing Brabham Alfa Romeo decal on the rear panel and the obligatory Quadrifoglio Verde sticker on the front wing. With a white paint finish that caught the bright sunlight every time it ventured out of the paddock and onto track and Italian stripes, it was simply like nothing else. Classic car ownership in Thailand involves modern modifications mixed in with the original style to customise the car to the owners' desires. Amongst the runners in the parade was an immaculate 132 1800 GLS completed with lowered suspension, distinct black-centred alloy wheels, big yellow 4-pot aluminium brake calipers and fat tyres that were squeezed tightly into the arches. Inside, the cabin was also adapted. It was a similar case with the oldest car on show, what looked very much like a Fiat 1100E from around 1949-50 which was shod with recent Fiat series alloy wheels and an interior reupholstered in bright modern soft fabrics. 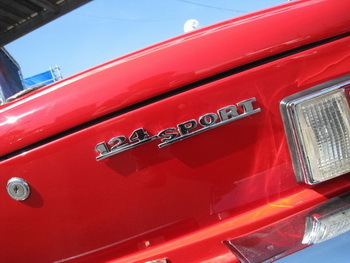 The final pure Fiat was a 124 Sport Spider 1600 with a spectacular all-original cabin, perfect for touring in the Thai climate; during the parade its hood was thrown back, the driver sitting upright in the leather seats, stylish and elegant Italian motoring as only Fiat can do it. Unusually there was a Polski-Fiat 125P in the parade too. Its distinctive metallic green coat was far from original, but this four-door sedan rolled up to the Bangsaen street circuit complete with the split red-and-white Polski-Fiat grille badge, while inside the cabin the original hard-wearing vinyl door cards, enveloping floor covers and basic dashboard, all designed for the less aesthetically minded Soviet-dominated East European markets of the post-WWII era, were much in evidence. 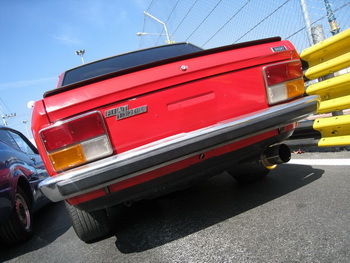 The final Italian representative in the column of classics came from Maranello in the shape of a distinctive Rosso Corsa finished Ferrari 328 GTS. The Italian cars on show were complemented by a whole array of interesting metal, including a variety of slippery Porsches and square-cut Toyotas with other classic cars to stand out including an E-Type Jaguar, a banana-yellow late model Lotus Esprit, an immaculate dark and broody Porsche 928, a 1960s Ford Mustang muscle car, a Datsun 1600 SSS with its distinctive full-width rear lights and several examples from the German VW automaker namely a two-tone grey/white Combi with mirror-polished alloy wheels and an exhaust sticking out the back that betrayed signs that the air-cooled lump had been discarded as well as an orange Golf MkI racer in Jägermeister livery and a couple of Beetles. Behind the flashing lights of the Course Car the long snake of historical motoring treasures rolled onto the circuit, cutting through one of the many access roads that linked one side of the track with the other to pull up to form a four-wide grid at the start-finish line where Bangasaen Thailand Speed Festival 2009 was officially opened by an array of dignitaries and VIPs. With the ceremony over, and to the applause of the spectators, the long column rolled its way round the temporary track as it snaked alongside the beachfront between acres of shining steel crash barriers and round the 180-degree paddock hairpin before heading back to the exit at the start finish line.